A poster advertising the attractions of Sāmoa. le Penina o le Pasefika; I ‘ila; Lanumoana; Ta ‘alaelae. Afio mai loa ile Parataiso. O lo ‘o to ‘afilemu ma saogalemu le atunu ‘u. The visual information in the poster is carefully chosen to appeal to people in New Zealand wanting a holiday destination. For example, the photo shows blue skies, blue sea, coconut palms, and indigenous housing (fale). These latter two items add an exotic dimension and promote the idea that, by going to Sāmoa, the reader will escape their everyday existence and enjoy a real holiday. The designer has used a photo that contains features that are likely to prove attractive to potential visitors: blue skies, coconut palms, local-style building, etc. As the 'fale' and the coconut palms are not typical of New Zealand, they help create a sense of the 'exotic' in viewers’ minds. E taugofie toe faigofie Sāmoa ia te a ‘u. O le atunu ‘u matagofie ma le matalasi. “O lo ‘o to ‘afilemu ma saogalemu le atunu ‘u”. The designer uses respectful terms to acknowledge and communicate with readers, for example, 'Afio mai loa'. The designer uses visual material to suggest an open, free, and relaxed environment. Similar visual material is often found in advertisements for tourist destinations. 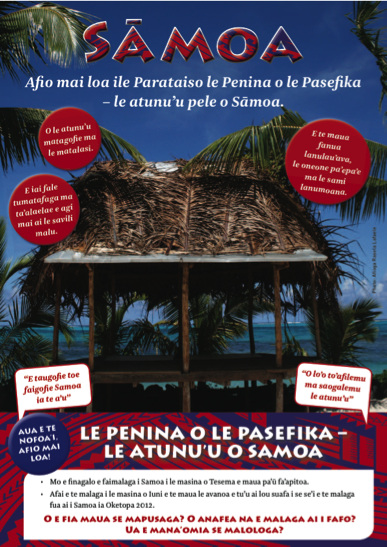 The poster is a written and visual text designed to convince potential tourists to make Sāmoa their holiday destination. A combination of written and visual elements that work together to present a more convincing case than they could do separately. The placement of words on the photo creates powerful associations in the minds of viewers/readers, which they link to whatever knowledge they already have of Sāmoa and the Pacific (whether from direct or indirect experience) and construct meaning. Penina o le Pasefika; Parataiso; To ‘afilemu. O e fia maua se mapusaga? O anafea na e malaga ai i fafo? Ua e mana ‘omia se malologa? “O lo ‘o to ‘afilemu ma saogalemu le atunu ‘u”) are used to suggest that you, too, will have a great experience of Sāmoa. Repetition emphasises the message; for example, Le Penina o le Pasefika appears as a major caption and twice elsewhere. Stand-alone phrases catch the eye of the reader and encourage them to read the subtext. Readers do not read a poster in the same way as they read a written text (in linear fashion, from left to right). Instead, they tend to go first to the high-impact elements and then gather information from the other visual and text elements in any order. The photo and the various types of written text (captions, quotes, questions, sentences, phrases, metaphors) offer the viewer/reader different entry points. Investigate metaphors associated with Sāmoa, New Zealand (for example, Aotearoa, 'land of the long, white cloud'), and other countries. Compare and contrast brochures advertising New Zealand and and Sāmoa. Consider the purposes of these brochures, the target audience, why certain features are highlighted, and the kinds of language used. Would the inhabitants describe their own country in such terms? Students could prepare posters in gagana Sāmoa advertising the attractions of New Zealand.